Availability: In Stock Size: 740 x 540 x 620 mm Shipping Weight: 63 kg Category: PowerDim. The 10U Patchable PowerDim is the best-selling item of the PowerDim range, packed with the same features as the 6U PowerDim, except with the addition of a Wieland ST17/2 Patch facility (GST18 Patch facility available on request) as well as space for your show accessories inside the same flightcase (as illustrated in the photos with a GSL 1U 8Way Splitter Box and 1U LED Rack Light). 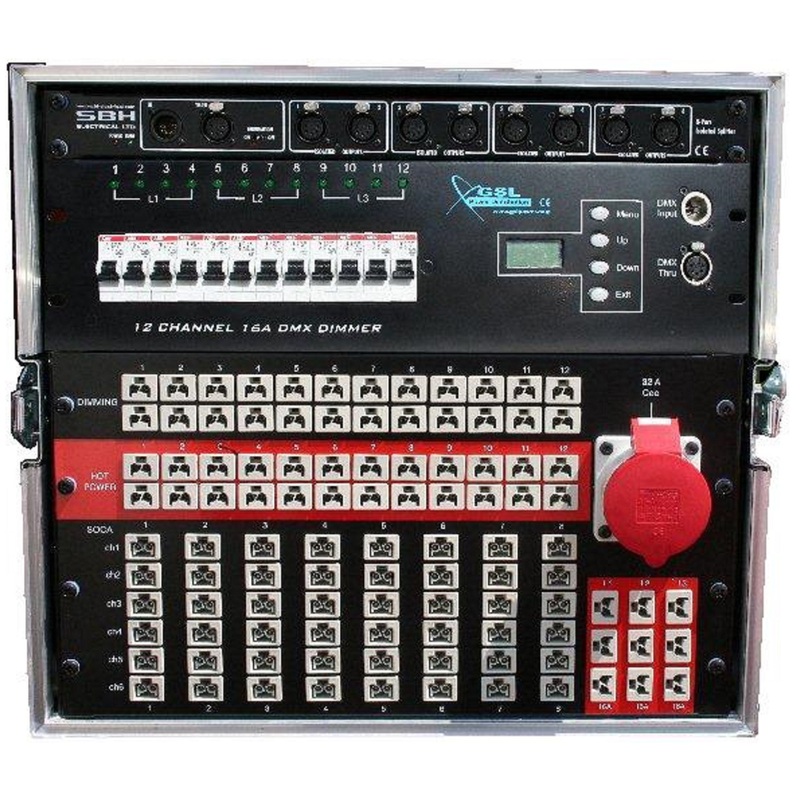 This 10U show-in-a-box is designed with the market leading LSC 12ch GenVI Dimmer Module which has each individual channel 30mA RCD protected (visit http://www.lsclighting.com/products/dimmers/genvi-dimmer for more details). The 10U Patchable PowerDim has every Output individually 30mA RCD protected. 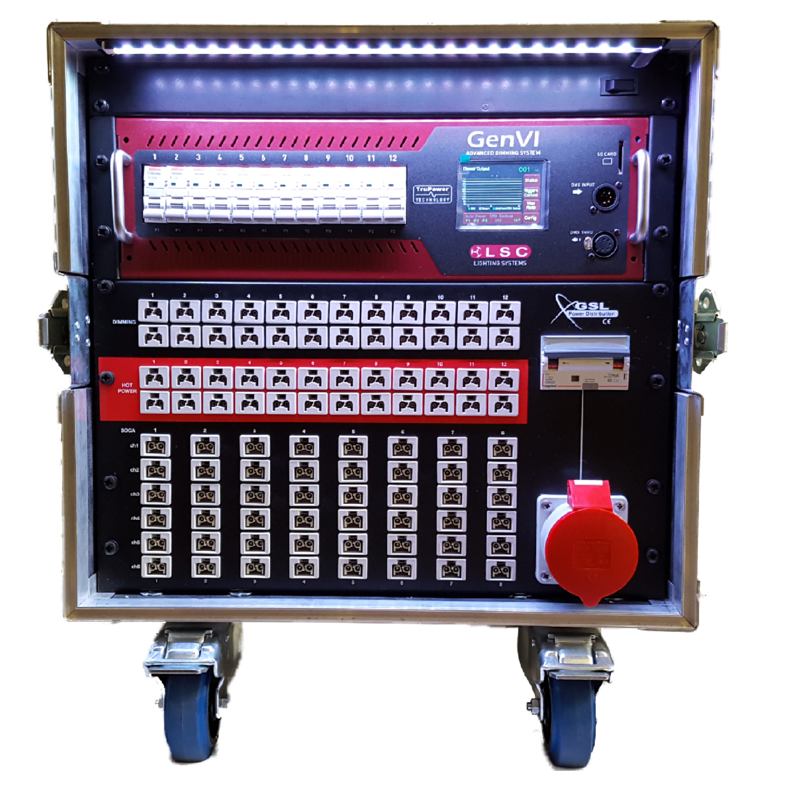 The Hot Power Patch facility is protected 12 x 16A SP 30mA RCBOs, with the Hot Power Patch highlighted with red screen print on the front. 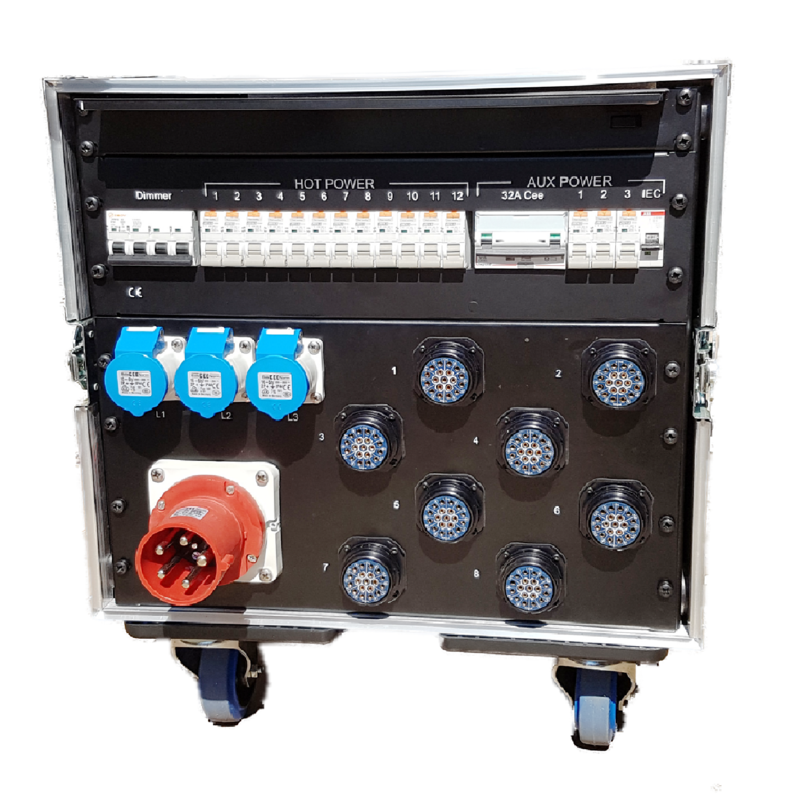 To complete the PowerDim there are also 3 x 16A 1ph Outputs protected by 3 x 16A SP 30mA RCBOs and 1 x 32A 3ph Output on the front protected by 1 x 32A 4P 30mA RCBO. 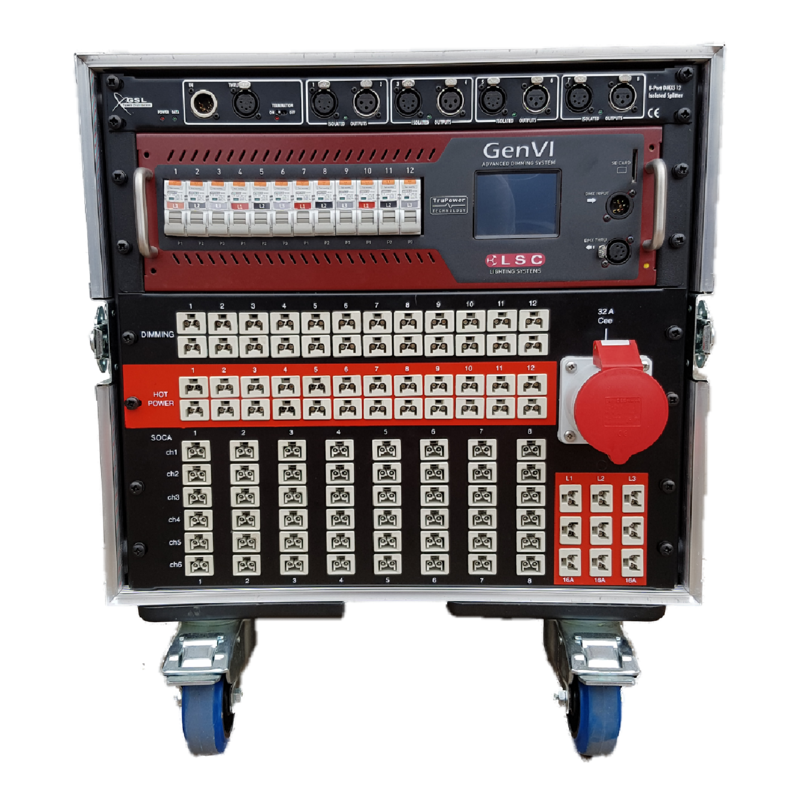 Finally there is an internal trailing IEC Output protected by a 6A SP MCB for any accessories (such as the GSL 1U 8Way DMX Splitter Box) and a hard wired trailing IEC if a 1U LED Rack Light is required. There is a 1U space at the top of the distro on each side for these items to be slid into. If you would like your PowerDim to come with these accessories already fitted, please contact GSL who will be able to offer a discount when all purchased together. 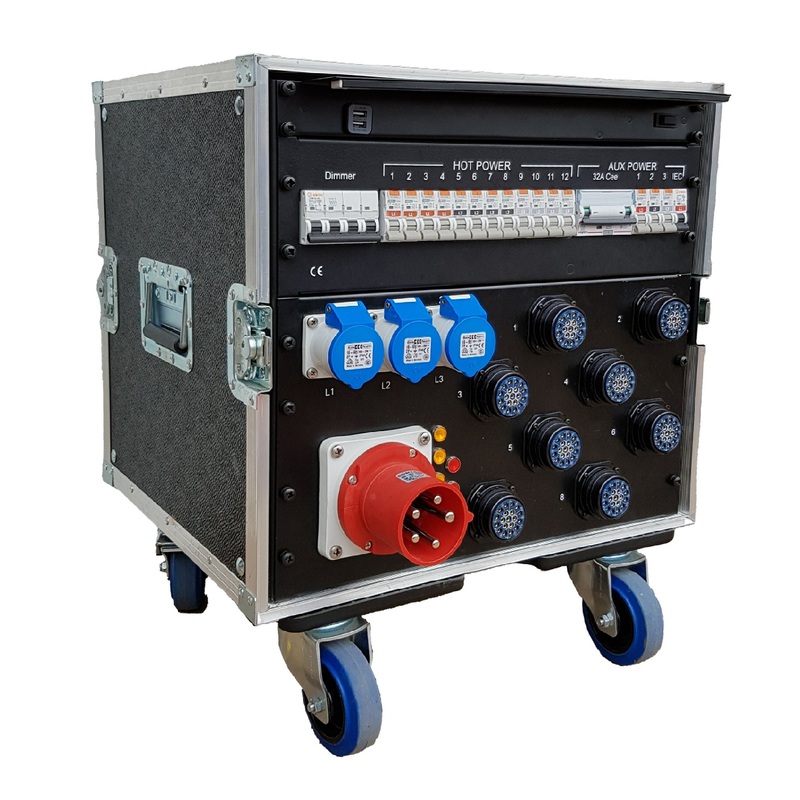 The 10U Patchable PowerDim comes with a 63Amp 3ph Plug mounted onto the rear panel (or alternatively you can choose to have a trailing lead), and is built into a quality 10U Flightcase with wheels + brakes on the bottom (or skids if preferred). The metalwork is powder coated black, stoved to a matt finish and fully screen printed. 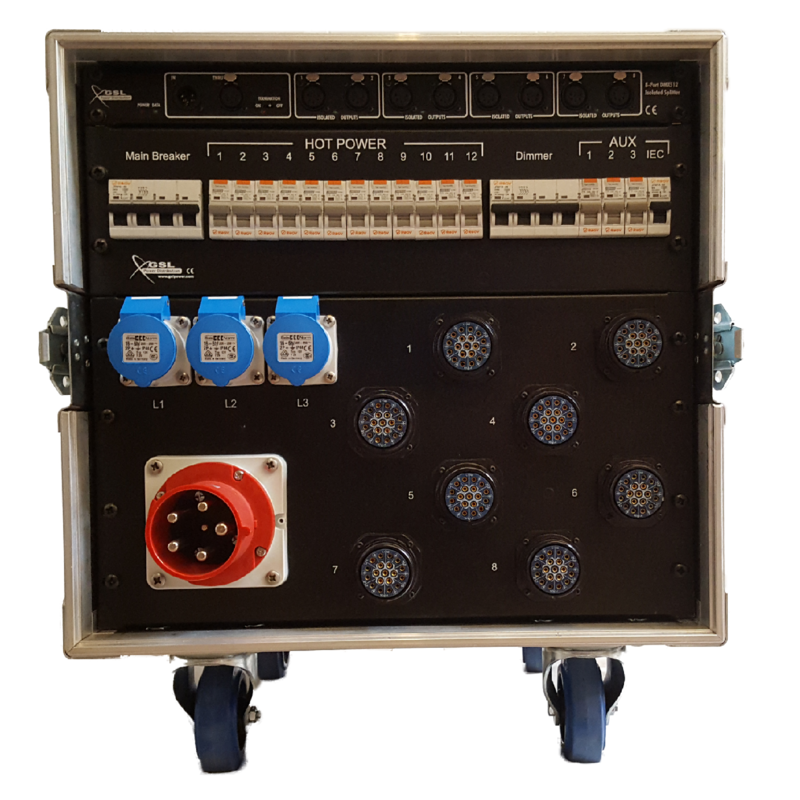 At an affordable price, with full individual 30mA Earth Leakage Protection, and a market leading dimmer module, the 10U Patchable PowerDim is a product that will appeal to large companies, small companies and individuals alike. Wieland ST17/2 Patch Leads are also available on request.